At this time of year most homeschoolers are feeling a little bit burnt out. That’s no wonder after an intense ten months of teaching some of the most important people in our lives some of the most important things they will ever learn. Or perhaps vainly trying to teach them without actually succeeding, which is even more tiring. And then there are all the other things we do as well. Recently I realized that, for the past few years, I have been trying to do more than I can physically manage. Although some of the biggest energy uses have been unavoidable and completely necessary, I should have given myself more downtime to refresh afterwards. 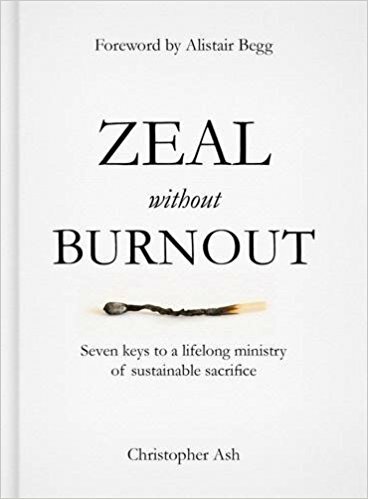 Christopher Ash’s book Zeal without Burnout is helping me come to terms with the fact that zeal, while important, must be tempered with wisdom in order to last (Rom 12:11). Few of us are called to overwork ourselves for more than short seasons of our lives. In general, God calls us to be wise, not foolish, burning out our lamps without having extra oil to spare. Sometimes, however, we do not realize when we are doing too much. What’s more, at one time or another many of us deal with the temptation to choose to do more than we should and we occasionally foolishly set ourselves up for burnout without even realizing it. And that’s where Zeal without Burnout comes in. It shows us how to live lives that are both effective and sustainable. Yes, there may still be all kinds of sacrifice, but it is sustainable sacrifice so that we can continue to serve God zealously for the long term. This is a message that most of us moms, especially homeschoolers, need to hear. Ash’s Seven keys to a lifelong ministry of sustainable sacrifice are so simple—and also so obvious—that we really should not need such a book. However, one of the signs of approaching burnout is that the person often does not realize what is obvious to others: the pressure he or she is under. So, here is a quick list of the seven points that Ash discusses with gospel wisdom, practical advice, and stories. We need sleep, and God does not. We need Sabbath rests, and God does not. We need friends, and God does not. We need inward renewal, and God does not. A delight: rejoice in grace, not gifts! We all repeatedly need be reminded of the biblical truth that we are finite and that therefore our service has limits. We also need the reminder that God has no limits and is ultimately in control. As homeschooling parents, then, we need to remember that our children are God’s children and that he loves them. Of course, we need to care for them, read the Bible with them, teach them math, insist on completed schoolwork, supervise cellphones, and so much more. But even more, we need to trust God. We need to remember that we cannot give them learning and, especially, we cannot give them faith. While we obviously need to do our best, we need to trust God, not our own intense efforts, for results. 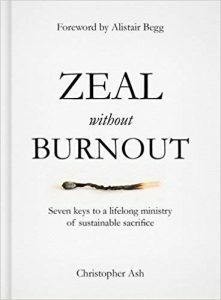 When we forget this in our everyday lives, we put ourselves at risk for burnout just as surely as the workers in Christian ministry that Ash has written this book for. If all homeschoolers, indeed all parents, would read Zeal without Burnout and take it to heart, the world would change for the better. Of course, this little book is also helpful for anyone else who loves God and is tempted to serve him with more zeal than wisdom. I highly recommend it as summer reading for homeschooling mothers and everyone who wishes to serve God sustainably for a lifetime. Note: These ideas are not for lazy people and this is not a plea for taking it easy. It is a plea for wisdom in serving God. Ash’s book helps us understand what that means. Disclosure: We borrowed this book from the library and are not compensated for our honest opinions. Posted in: 52 Books in 52 Weeks, Health, Life, Reviews, Reviews: Nonfiction, Reviews: Reformed.